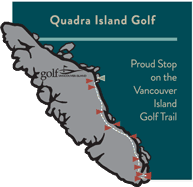 The Quadra Island Golf Club offers a distinctively different golfing experience boasting broad ocean vistas of the Sutil Channel and BC’s mainland coastal mountain range. Standing stone formations and the ethereal quiet of the forest combine to make this an exceptional experience. The contours of this secluded forest landscape create an indelible nine-hole experience. No matter what your skill level, your round at Quadra Island Golf Club will be an enjoyable challenge and a pleasant surprise. With a convenient 10-minute ferry ride from downtown Campbell River, you can walk on the ferry with your clubs and take advantage of our free round-trip shuttle service from either of the BC Ferry Terminals or be picked up and returned to any of the local resorts and/or marinas.